Stop! Before using a commercial product that may damage your carpet fibers, call the experts at Viviane's Cleaning & Restoration Inc. 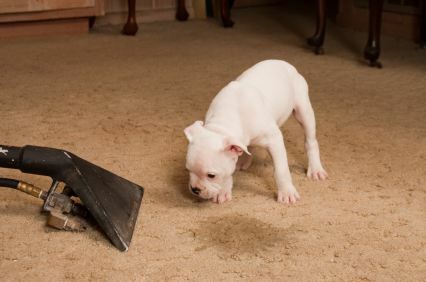 Nasty odors aside, pet stains, vomit and other spills can cause permanent damage to your carpet and upholstery fabrics. Odor and stain removal, whether from pets, kids, or a crazy party, is a science. Viviane's Cleaning & Restoration Inc odor removal technicians are highly skilled in odor and urine removal. When disaster strikes, prompt clean up is ideal. Warm, acidic urine breeds bacteria, and as the urine dries, the ammonia it contains can cause a permanent stain in your carpet or upholstery. The urine and odor removal experts at Viviane's Cleaning & Restoration Inc will tell you that water can actually WORSEN the stench associated with urine. This explains the increase in calls we receive from pet owners on humid days. Viviane's Cleaning & Restoration Inc technicians will permanently remove pet urine stains and neutralize the odors, leaving your carpet smelling fresh and looking new again. Call Viviane's Cleaning & Restoration Inc today and be free of that SMELL!